Please feel free to post comments and questions here in our guestbook (the guestbook submission form is at the bottom of the page). Ole hyvä ja jätä viestisi tai kysymys vieraskirjaamme (sen voit tehdä myös suomen kielellä). I am writing on behalf of my son aged 10. 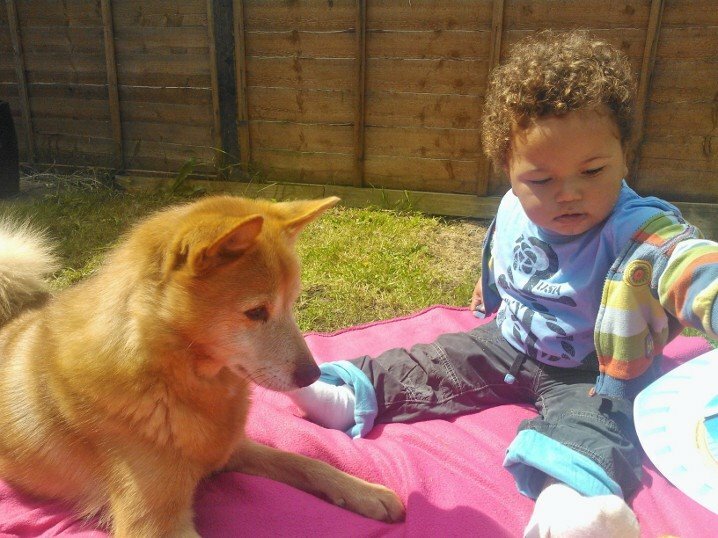 He has become very interested in the Finnish Spitz breed and would love to join the society (along with his sister). He likes the idea of supporting the breed and is also interested in several items in the shop! We don’t know anyone who is currently a member so don’t know what to do about a proposer and seconder. We hope that membership of the Society is possible though! Do you still produce the annual year book, I have not received one for a few years ? I would like to seek some advice on my 8 year old FS. I would be very grateful if you could email me at the below account. Thank you. We have been owned by Finnish Spitz for the last 30+ years, sadly our last one died 18 months ago and we are left with our gorgeous rescued Elkhound. We have always also had a rescued elkhound or two, but our first Spitz was a Finnish Spitz. We would very happily offer a very loving home to another. Hello from Finland and great even better than never new year! Nice websites and thank you all having finnish spitz in your heart. Great that you appreciate original country too, its not same every breed and country! from: Pekka, Hakojen Kiiru, Soidinsalon Marja and Milla. Thank you Pekka for your comment. It’s good to remember the roots …… as it is the National breed of Finland. We do appreciate here the fact that it is a working dog over there. Have a very Happy New Year and we hope it will be very successful for you and your dogs. Thank you for your comments. It is true that the Finnish Spitz is very much a working dog in its native country. It is good that its excellent and unique hunting qualities are maintained and looked after in Finland and neighbouring countries. Although they are not used for that purpose here, it is something that we can appreciate. However, they are not all working dogs even over there. The Finnish Spitz can make a lovely family pet and they are very good with children and very curious in nature. It is possible to involve the dog in other kind of activities as well like showing, obedience, agility etc. Hello, I’ve recently discovered the Finnish spitz breed whilst on holiday in Finland. While all my fellows where exclaiming over the huskies at the trek centre it was the little prick-eared dog who I’d been lucky enough to have a quick fuss and play with who stole my heart! I notice that you have a championship show in June and I would love to meet some breeders and their dogs to learn more, can non Finnish spitz club members visit the show? Thank you very much for your comments Emma. It’s always very nice to see the breed in its native country – it sounds like you were somewhere in the north! You are very welcome to come and visit our Championship show in June and we would love to see you there. It is a good place to see the dogs and talk to owners and breeders. That’s brilliant and thank you for replying so quickly on a bank holiday! Yes we were in the north, up near Kittila and it was great to see him in the snow! I look forward to learning more about these lovely dogs in June. * A gallery page so people can flick through all of the pictures both professional looking and silly dogs at home types. The dogs need not be named just represented on the page. * There is a gentleman jeweller on facebook asking for photos of the breed so that he can make pendants etc. it would be fantastic to be able to direct him here so that he can use this site as his reference for the breed….. and then maybe sell his work on the merchandise page when it is set up and running. * Past and present winners within the breed with a photo (not an extensive archive but just the past say 10 years onwards). The yearly points and pictures of those individuals. * Put photos of the individual shows up with the results. * Get visitors to send their artwork of the breed, there are many talented people out there maybe we could commission some work and then sell prints of it. Thanks Clare. I think you’ve got some great ideas there. We can easily display a gallery or a slideshow of all the photos that currently appear randomly in “Our Friends …” Or we could have galleries or slideshows of other photos that people send to us. Your suggestion about the pendants is definitely worth following up and we would really appreciate some nice illustations to put on the website. We will need some help in putting together lists of past winners and show photos etc. So if anyone has already got those details and photos to hand, please send them to us and that can be done! It’s a pleasure to see your site so informative and easy to navigate. Much future success to the FSS. Thanks very much for your kind comments Jan! lets all put a link to this site on our faceboook and ask everyone to pass it around and see how many hits we get. A wonderful, well-designed site! Thank you for linking the the Finnish Spitz Club of America’s website. Thanks very much to you Peggy. It’s a pleasure to link the FSCA website. Thanks for your suggestion. We do already have links on the website to judges’ critiques for the 2 FS Society Shows held in 2012. We’ll certainly have a look at the possibility of adding critiques for some other shows in the future. I am so pleased to see that the society web site is up and running. Clearly a great deal of work has gone into it. Well done to all concerned. Thanks very much for your kind comments and appreciation David! May I suggest that David Rolfe’s regular ‘breed notes’ entries in the dogworld newspaper also be incorporated into this site as he gives an atmosphere of the shows and this would complement the results page. Hello David, An archive of breed notes articles from the beginning of 2012 is now on the ‘Breed Diary’ page and future breed notes will be added a week after original publication. Congratulations. A clear concise website, which gives an excellent interpretation of the breed. In particular,liked photos of Finnish Spitz which show the breed so well in a variety of activities. Lovely website! I love the puppies, what a super idea. Lots of useful information which could perhaps include a list of judges. I am sure the site will be admired by all breed enthusiasts. Thanks very much for your feedback, Wendy. I will add a list of approved judges in the UK to the website shortly. Update – now added as a link from the ‘Judges Training’ page. Thank you! There is in fact already a page that does exactly what you’ve asked for. Just click on ‘Shows & Events’ and then ‘Finnish Spitz Show List’.